Canon Pixma MX922 Office All-in-One printer. Eight years is a long time in the life of a printer, and that's how long it has been since the debut of Canon's Pixma MX7600 All-in-One Printer, and most likely seven years since Canon replaced it with another "MX," or office-centric, model. The closest thing to that nowadays is the Pixma MX922 Wireless Office All-in-One Printer. 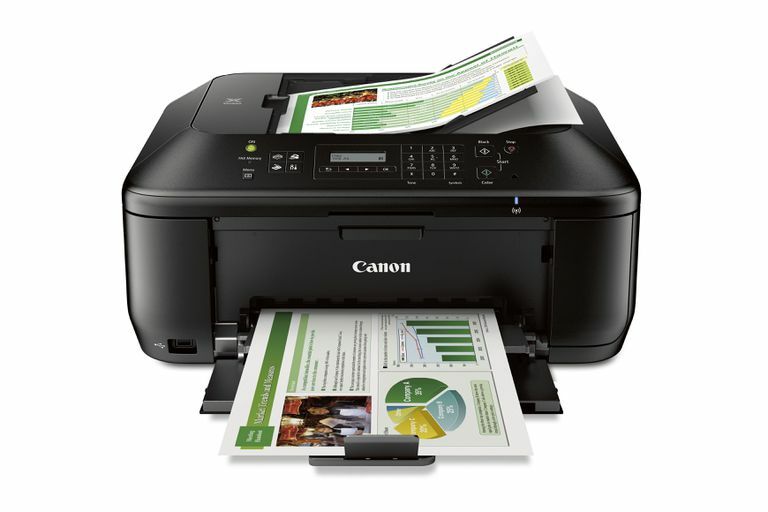 Like other Canon all-in-one printers, this all-in-one printer is a useful and hard working tool. Print quality is exceptional and it's a real convenience to be able to use plain paper and still get good results. It's a big and heavy piece of machinery and it's certainly priced at the high-end of the all-in-one inkjet market, and we don't think the boost in print quality is enough to make it a much better choice than other Pixmas; but if you want the top-of-the-line quality and don't mind paying extra, you'll love the MX7600. If people named their printers the way that some of us name their cars, the Canon Pixma MX7600 All-in-One Printer would be called "The Beast." At nearly 40 lbs, it was tough just to get it up the stairs and out of its carton. But once it gets to work, it's quick to prove that its bulk is justified. This Pixma features a technology called PgR, which adds a large tank of clear ink to the printer's six black and color ink tanks. The clear ink goes on in a thin layer before the other inks and helps create clear, good-looking color graphics as well as crisp black text. Even better, the additional layer of ink helps prevent smudging of the inks, even if you print on plain paper. On the downside, it's one more ink cartridge to replace. Prints come out fairly fast, with a 4x6 color photo printed in under a minute and an 8x10 color photo in not much over a minute. The quality was excellent; photos were sharp and the colors vivid, and the ink was dry to the touch the moment the prints came out. Printing in full color on plain paper did leave the paper slightly limp but not sloppy or moist as can be the case when printing on anything but inkjet paper. Fax, scan, and copy functions all worked well. The printer's LCD screen is rather small considering the size of the rest of the unit, and buttons are nicely spaced out (an added Memory Card button is handy when preparing to print photos from an SD card or other media). We've never been too impressed with the software Canon offers (Easy-PhotoPrint EX, MP Navigator EX, Newsoft Presto Page Manage) which all works adequately but seems more a required add-on than a well-thought-out choice of graphics software. Kudos to Canon for making the printer networkable but demerits for not making it wireless. With wireless networking practically ubiquitous, it's time to start making that a standard function.